The head of Daimler’s Truck and Bus business division, Martin Daum, said that not all new technologies ultimately pan out. And truck platooning may be one of them. The 2018 IAA Commercial Vehicle Show in Hannover, Germany, is a snapshot of an industry in flux, transitioning rapidly toward a future filled with new technologies such as electrification and automation. 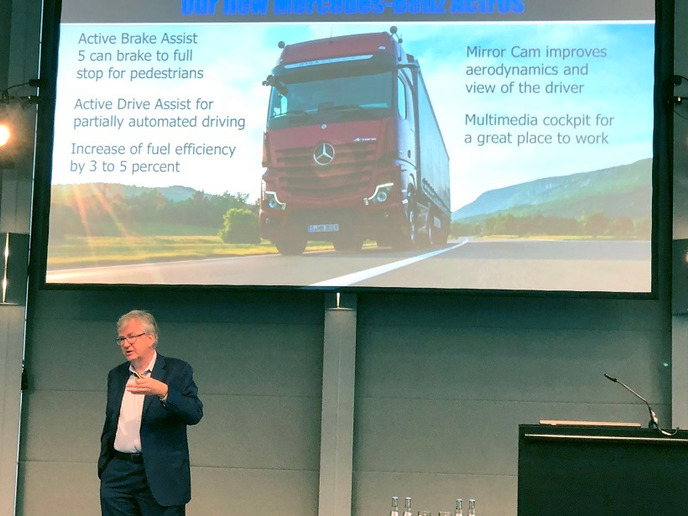 However, in his remarks as the keynote speaker at the annual Heavy Duty Manufacturers Association Breakfast Friday morning in Hannover, Martin Daum, head of Daimler’s global truck and bus business, noted that while trucking is in an “analyze, failure and learning” mode in adapting new technology, not all new systems or initiatives ultimately earn a spot on a commercial vehicle. And truck platooning, he said, may be one such technological dead end. There’s a lot of excitement and hype surrounding trucking technology, said Wilfried Aulbur with Roland Berger Consultants, who spoke on electric and automation trends in trucking. He noted that in terms of stock values on paper, Tesla is worth 20 times more than Daimler and 80 times more than Ford. Not that those figures reflect the equity of those businesses, he said, but they’re a telling indicator about much of the buzz surrounding trucking tech. But it’s not all hype. Aulbur said change is coming, and predicted that by 2025, real world data will verify a return on investment of 42 to 60 months for new electric trucks. “So, there is a solid business case to made for operating these vehicles,” he said. However, he noted it is unlikely there will be a large penetration of electric trucks in heavy-duty market segments and stressed that the bulk of orders will be in bus and medium-duty vocational truck markets. Sandeep Kar, chief strategy officer for telematics developer Fleet Complete, centered his remarks on the rise of data throughout the trucking industry and how that trend will only accelerate in the future. A few years ago, he noted, Walmart was fining fleets when drivers arrived late to appointed dock times. Today the company is countering the facility congestion that move caused by fining fleets if drivers arrive early. Kar sees this as an opening salvo in a push toward a data-driven revolution in just-in-time deliveries. Telematics and big data will be key enablers, he said, eventually supercharging the effectiveness and efficiency of the entire trucking logistics network. Is the ROI There for Truck Platooning? The reason, Daum explained, is that while platooning tests in the past have yielded good results in boosting fuel economy on older model trucks and trailers, recent testing has shown that the MPG results in platooning operations were “not as high as expected” for newer model vehicles with highly efficient aerodynamic tractor-trailer combinations.